According to the Foreign Trade Agency under the Ministry of Industry and Trade, despite several cases of trade protectionism on export steel products of Vietnam, the country’s steel export market has still managed to achieve high growth. After slightly declining in the first two months of this year, exports of steel products have improved and recovered in March this year, estimated at US$280 million, an increase of 60.3 percent over the previous month and 6.8 percent over the same period last year, raising total steel export turnover of the first quarter of this year to $744 million, up 5.8 percent year-on-year. The US, EU and South East Asia respectively are the main export markets of Vietnamese steel products, accounting for roughly 55 percent of total steel exports. 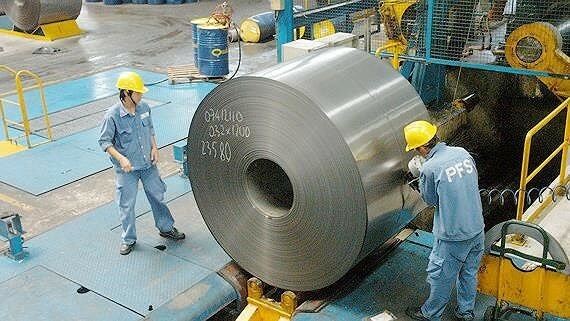 Besides, Vietnam also exports steel products to Japan, South Korea and India. According to the Ministry of Industry and Trade, such growth of steel exports came from rising momentum of last year. Steel manufacturers still received big steel export contracts in the first months of this year, signaling a busy year of the industry. 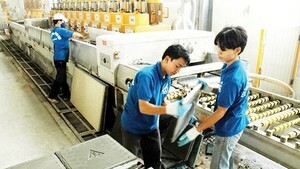 Noticeably, Hoa Sen Group signed a contract to export 4,300 tons of roofing sheets, worth $3.7 million to America. At the same time, the company successfully exported 17,000 tons of roofing sheets worth more than $14 million to the US from Nghi Son International Port in the central coastal province of Thanh Hoa. Hoa Phat Group also announced that it closed a deal to export nearly 1,000 tons of steel pipes to India worth more than $600,000. In addition, in the first quarter of this year, the company has also received many export contracts to the US and Canada. On the contrary to optimistic export of Vietnamese steel, Vietnam Steel Association (VSA) said that global steel market was gloomy in the first two months of this year with steel demand of some industries weakening. As for steel import, according to VSA, imports of finished steel product from China tended to drop, falling to nearly 6.27 million tons, down 10 percent in volume. Imports of finished steel product from China accounted for 46.3 percent of total imported steel products. The tendency to reduce import of steel from China of Vietnam individually and the world generally is supposed to be the result of import tariff of 25 percent on steel that the US imposed since March. On the other hand, the fact that the US and the EU continuously investigated whether Chinese steel companies shipped steel through other countries, disguised its origin to avoid anti-dumping duties, has made firms afraid of being involved in misfortune when importing steel from China. Accordingly, import of steel from China is expected to continue to decline, especially when local firms have been capable of producing most kinds of steel and no longer depended on import like before.